This review was originally published as a guest post on The Writes of Women blog (25th March 2014) and Naomi has kindly granted her permission for me to republish it here – I’ve held it till August to tie in with Biblibio’s Women in Translation month. 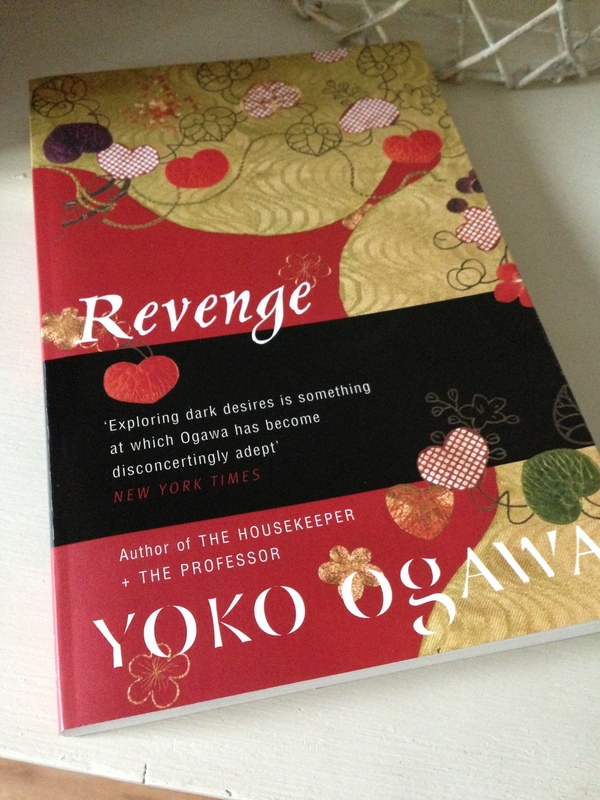 When the Independent Foreign Fiction Prize (IFFP) longlist was announced in early March I was thrilled to see Yoko Ogawa’s Revenge among the contenders. Ogawa was one of two female writers from Japan to make the shortlist this year. The other was Hiromi Kawakami for her novel Strange Weather in Tokyo which both Naomi and I have already reviewed for January in Japan, an annual focus on Japanese literature hosted by blogger (and fellow IFFP shadow-judge) Tony Malone – my review of Strange Weather; Naomi’s review. Revenge is a stunning yet unsettling collection of eleven interlinked short stories; while each individual tale works as a short story in its own right, they are elegantly connected by a set of recurring images and signifiers threaded through the stories. Characters flow from one story to the next; we revisit specific locations and scenes from earlier tales, only to see things from a different viewpoint as our perspective has changed. It’s all very cleverly constructed, and part of the satisfaction in reading Revenge comes from spotting the connections between characters, scenes and narrative fragments throughout the collection. To give you an example, the collection opens with ‘Afternoon at the Bakery’ in which a woman visits a bakery to buy two strawberry shortcakes for her son’s birthday. At first the bakery appears to be empty, but then the woman notices the patissier standing in the kitchen sobbing gently while talking to someone on the telephone. This story ends before we learn more about the patissier, but she reappears in the next tale (‘Fruit Juice’) where we discover the source of her sadness. And strawberry shortcakes crop up again in a later story (‘Welcome to the Museum of Torture’) when another girl buys cakes (from the same bakery, as it happens) for a dinner with her boyfriend. Revenge is an excellent collection of short stories, each one adding new layers and connections to the overall narrative. On the surface Ogawa’s prose is clean and precise, beautifully captured by Stephen Snyder’s crystalline translation. And yet there’s an unsettling chill rippling through her work, an undercurrent of darkness if you like, which I find strangely alluring. Some of her stories have the feel of modern-day fairy tales, almost ethereal in their tone. Ogawa has a real talent for exploring some of the disquieting parts of the human psyche and how chilling acts of darkness can lurk just beneath the surface of the everyday. In this respect, her work reminds me a little of some of David Lynch’s films, especially Blue Velvet which opens with its lead character making a gruesome discovery in a field. And others, including one of the judges for this year’s IFFP, have likened Revenge to some of Angela Carter’s stories. High praise indeed. Several other bloggers have reviewed Revenge including fellow IFFP-shadow participants: Stu at Winstonsdad’s, Tony Malone at Tony’s Reading List, David Hebblethwaite, Dolce Bellezza and Tony Messenger. Revenge is published in the UK by Harvill Secker. Source: personal copy. This entry was posted in Book Reviews, Ogawa Yoko, Women in Translation and tagged #ReadWomen, #ReadWomen2014, #TranslationThurs, #WITMonth, Fiction, IFFP, Japan, Literature in Translation, Short Stories, Stephen Snyder, Women in Translation, Yoko Ogawa on August 28, 2014 by JacquiWine. You should, Helen! I can recommend both Revenge and The Diving Pool, so whichever takes your fancy. Ah fantastic, I remember that giveaway! I hope you enjoy Ogawa. Small world! It was just yesterday that I discovered The Writes of Women and that a plug there convinced me I must try Ogawa. So I put in my order for The Diving Pool . . . Many thanks for this excellent review. Revenge sounds like the Ogawa I should follow up with. A very timely discovery, John! David, Naomi and I are all big fans of Ogawa, and The Diving Pool is a great place to start. If you enjoy that one, then Revenge is a logical next step and the recurring symbols and connections really add to the intrigue and experience of reading the collection. Thanks for your kind words regarding my review! Thank you. Yes, there’s been quite a buzz about Ogawa this year (boosted by Revenge’s inclusion on the IFFP shortlist) and she’s well worth checking out. The individual stories all work in their own right, but what really elevates this collection to the next level is the recurring signifiers and connections threaded through the stories. A very intriguing read. I hope you enjoy Revenge, Gemma. Very welcome, Stu. Yes, me too. The recurring images and connections really add another another dimension to the collection. The connections between the stories do sound so very well constructed. The disquieting nature of the stories sound intriguing. I appreciate the reference to Blue Velvet as I find that to be such an unnerving film. I had never heard of Ogawa but I do want to read her now. Very cleverly constructed, Brian. It would be fascinating to hear Ogawa discuss her approach to writing this collection, how she connected the stories together with the recurring images and motifs. The stories themselves are quite unsettling, and it’s the sense of something chilling lurking beneath the surface of respectability that reminded me of Blue Velvet. Ogawa’s quite big in Japan, as they say; she’s definitely worth checking out. I haven’t read Revenge, but one thing I’ve liked and envied in Ogawa, in what I’ve read anyway, is – well, that word “crystalline” get at it well – her clarity. Everything has clean lines. Her works contain universes that are sharply delineated (and, admittedly, a bit cold). They also remind me at times of Joseph Cornell’s boxes; she places a great premium on atmosphere and on lyrical images that come together to form mysterious, evocative, poetic, and, yes, somewhat disturbing worlds, even if the works appear to have a certain similarity to one another that goes beyond style. I am still waiting patiently for my favorite of her novels I’ve read so far – which I read in French with the title La Petite Pièce Hexagonale (The Small Hexagonal Room) – to be translated into English. I’m not familiar with Joseph Cornell so I’ll take a look – thanks for mentioning him. Hmmm. I’ll keep this in mind. No worries. It’s not crime fiction, but there’s some rather creepy behaviour on display here. Interesting from a psychological point of view, I think.